Thank you! I'm away from home for a few days but when we get home I'm going to try this! Karen, thank you! Do let me know how it goes. And enjoy your days away! Hey Jean! Here's my reply to your comment at my blog. After reading your article, I think it's brilliant! Laura, thank you so much. Right -- there's nothing difficult about gravy, it's just the last-minute-ness of it all! Good thing that I just have to cook for my husband and he is not fancy for turkey at all...too complicated to cook for a large group of people. But I for sure would love to try that broth! Angie, my father was not a fan of turkey or any poultry, but he would eat it once a year! :-) I especially love all its "go-withs" -- mashed potatoes, gravy, stuffing/dressing. “A cannibal is someone who loves his fellow man…with gravy.” Yup, that’s all I got. Gravy is one of those tastebud neutral foods that I completely ignore. Mud soup. No zing. Right in there with the category of potatoes, melons, rutabaga, squash, asparagus etc., etc. Was a time when I followed the leader and made a little pond in mashed potatoes with the back of a spoon, filled it with oily looking gravy, and added butter to make it palatable. Then I turned 10 and the world became technicolor to my taste buds. Sweetness and tang play large – I admit it. But I do like slightly cloying exotic stuff if it isn’t dishwater bland and slushy, like, like…rice pudding. Peace, gravy-eaters…you have gravitas. I mean gravy-toss. Sully, all I have to say to that -- and you're entitled to your opinion -- is that there is more bad gravy "out there" than there is good, and you've probably never had good gravy. If you had grown up eating my mother's and grandmothers' gravy, you would be a gravy lover, I'm sure. I learned at a young age to not put a gallon of gravy on my plate when dining away from home until I'd tasted it to see if it was good. You might say "gravy is gravy," but I'm here to tell you that isn't true! The first time I tried making gravy with directions from my grandpa, I had to chisel it out of the pan. 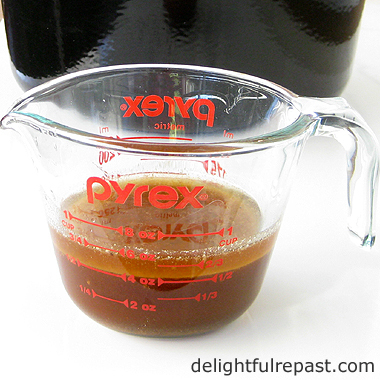 Since then, I have used Pacific Organic Turkey Gravy as I actually liked it. My tastes tend to run to bland or one note due to digestive issues. I might just give this recipe a try!! Thanks! Too funny, Cheryl! I wouldn't dare use a store-bought gravy, even if it was great -- with my gravy "history," it just wouldn't fly! Here's a little gravy story about my great grandmother: http://www.delightfulrepast.com/2010/04/cream-gravy-southern-classic.html. I can make gravy. There are ways and means. That's it, Jean and I am very sorry about your new President. Just a thought, Jean, I have reread some of your description above. You mention, mashed potatoes with your Turkey. We place a few par boiled potatoes in with the turkey when its almost fully roasted,baste the potatoes with the hot Turkey fat and roast the potatoes alongside the turkey. Probably Christmas Day is one of the few days we might not do mashed potatoes. Different cultures different traditions I suppose. Thanks, Jeanie. I love your idea of "holding it in check and dazzling him!" Let me know how it goes. This looks super yummmy! Thanks for sharing. Thanks, J. It IS good, can't wait to have it! Wonderful Jean! I have already printed it out, and will be making the gravy next week. I LOVE not feeling stressed about getting gravy made, as all the guests wait! Thanks, Joanne! I think making it ahead really helps the cook's stress level when there are sooooo many things to do! Hope you like it. I'm definitely all about the advance planning. I hope that you get your tea outing soon! I do make my turkey stock before and make several food items the days before...so on turkey day it's pull it all together and cook then eat and feel stuffed. I can't believe thanksgiving is in two weeks! Thanks, Margie! I'm sure I'll blog about when I do! That's the way to do it, Cathy! Get it down to where about the only thing left to do on the day is to heat up stuff, eat it and feel stuffed! Thanksgiving is one of my favorite holidays. For years we didn't spend Christmas with my folks because of the weather but we always made Thanksgiving. My mamma was in heaven knowing she was feeding the people she loved. Great tips! 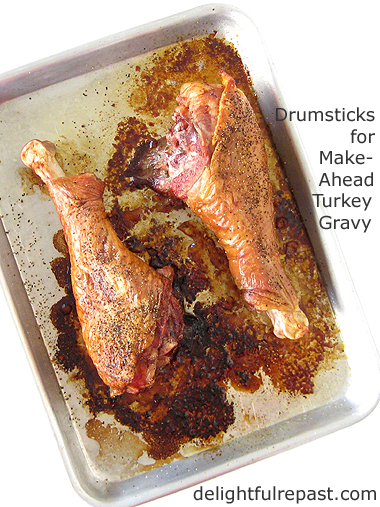 Mmmmm I love homemade gravy, and using drumsticks is a great idea, Jean! Thanks for sharing your hints and ideas with us. Marisa, thank you for sharing great memories. Seems most of my fondest memories of my mother are food memories! Thanks, Kitty! Being "streamlined" in the kitchen gets more and more important to me all the time! Thank you so much! The older I get, the more I like to prepare ahead of time! Mildred, isn't that the truth?! I hope you have a wonderful weekend, too. Thank you so much, Martha Ellen! The mashed potatoes and gravy are the best part of a turkey dinner to me! Jean, this is a fantastic idea! My mother in law loves dark meat, but no one else likes it. We prefer to roast a turkey breast, which doesn't make much gravy. This will be the answer to our problems even if we make it all that same day. Thanks for letting me know. Jean, in addition to adding you to my bloglist, I borrowed a picture to post today about your wonderful blog and recipe for turkey gravy. Thanks for all the work you do to provide such wonderful recipes to us. Thank you so much, ARC! My husband and I prefer just the turkey breast as well, so this works perfectly for us. I so appreciate your sharing it with your readers! I was just talking about this the other day to a friend who does this. Excellent idea!! Thanks, Doreen! It really saves a lot of wear and tear on the cook when making a big dinner with many items on the menu. Thank you, Sandi! I hope it will make for calmer cooking on big days! Sounds like a great recipe that families can enjoy for Thanksgiving. Thank you, Reuven. Having my freezer well stocked with homemade meals (and meal components like this) makes me feel so serene! Thanks, David! Let me know how it turns it for you! Jean, what a great idea! You're right about getting frazzled with the last-minute turkey gravy being prepared, as the guests are patiently waiting for the dinner to start. Thanks for sharing! Fran, thank you. Nothing worse than getting frazzled while entertaining! Never thought about making it ahead. Definitely something I need to try. I bet it's yummy! Thanks so much Jean for joining in on our Blogging Grandmothers Link Party #2. We sure appreciate you partying with us! Looking forward to you joining us again next weekend! Thanks, Grammy. And I hope you will try it soon. It reeeeeally helps! What a great idea to make the gravy ahead of time. It sure saves some stress in the kitchen while doing all the other prep work for Thanksgiving. Great idea. Making the gravy ahead of time would save time, don't know why I have never thought to do this. Thanks for joining Blogging Grandmothers link party. Thanks, Candace! Anytime, but especially when I'm cooking for a crowd, I like to do as much as possible ahead of time. You have stirred up a nice lot of conversation about gravy and other things. Like you I love to do things the day before I have guests. What ever will not spoil I get it out of the way and the associated mess is all cleaned away before the big day. Thanks, Kathleen. I wasn't really expecting so many comments on this one. Yes, it's especially nice to get "the associated mess" all taken care of the day before as well! I love anything that allows me to get ahead of the game. These recipes are awesome and since I am lucky enough to be off work the week before Thanksgiving, I am going to prepare my gravy and broth the Saturday before Thanksgiving. I've decided that will be my prep day. Thanks for sharing and thanks for being a part of Blogging Grandmothers Link Party. Please join us again. Thanks so much, Clearissa! I hope you'll let me know how they turned out for you. Great idea and that gravy has come out such a fantastic, rich colour. Thanks, ATIE! I like the color, too -- *and* without any additives! I absolutely love this post, Jean! There is nothing like homemade gravy and it's so wonderful to be able to make it again. Huge thanks for sharing it with us at Hearth and Soul. I'm featuring it at this week's party! This is brilliant! and of course I love doing anything ahead of time that I can. It sure helps with the crunch on the day. Thank you for the recipe, Jean. April, thank you! AND for featuring it! Thanks, Judy! I appreciate anything that softens the crunch! I've never thought of making gravy early. Then again I have never hosted Thanksgiving dinner. Sounds like a great idea though. Thanks for partying with us on Creative K Kids Tasty Tuesdays. Thank you, Audrey! And thanks for hosting Tasty Tuesdays. Love this make ahead idea! I get so frazzled by the time it's dinner time...i want to not make gravy!! Nazneen, I know! But I can't NOT make gravy, so this is perfect! Thank you. Thank you for sharing this, Jean! I've pinned it and I will be making it. Thanks, Carol! I'm so glad you're trying it! Jean, this is a clever idea. It seemed more difficult getting things all together at the end when I had kids running around. I don't mind it now. I have hubby take the turkey out and I get most of the juices out a bit ahead of time and make the gravy as the turkey is browning. Hubby even makes it sometimes. Thanks for sharing with SYC. 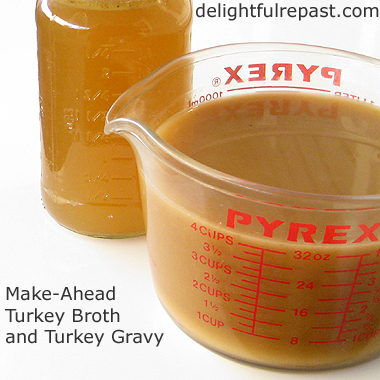 I love the idea of a make ahead Gravy for the big feast this looks awesome. 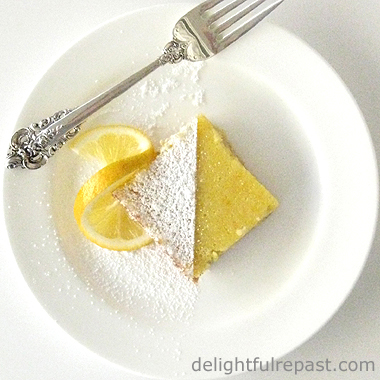 Thanks so much for sharing with Full Plate Thursday. Hope you had a great week and come back soon! Thank you, Miz Helen. I know YOU know what it's like trying to get 15 different dishes on the table for these big-deal dinners! That really does sound so amazing Jean. I'm not a very good cook but if there's one things that makes me go weak at the knees it's a good gravy made with love and lots of other bits. Your turkey gravy sounds like it would make my knees go wobbly. I've pinned it just in case I ever progress from burning everything to making something. Michelle, thank you so much. And I assure you, you can do this! There's no pressure, you just make it way ahead when you're alone, absolutely no pressure. Just follow my directions, and let me know if you have any questions. Jean! This is a great idea! I have made giblet gravy the day before Thanksgiving and then added the pan drippings to it but this has to be so much better and would make so much gravy! At my childhood home we always "flooded" our plates with gravy. 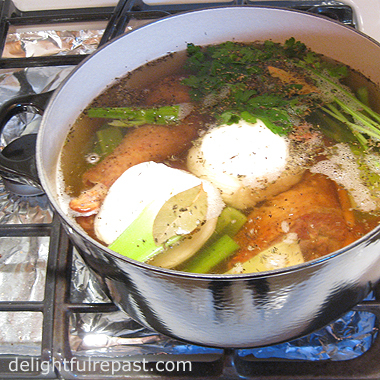 I was the youngest and mom would station me, partly to have me out of the traffic pattern in a busy kitchen I am sure, at a back corner of the stove to stir the gravy so it didn't lump or boil too hard, etc. So, the one thing I really knew well when first married was how to make gravy! I had watched Mom mix and add the thickening so many times... and I would stir away! It is a sweet memory for me now. But the funny thing is, after years of, well.. not really great gravy at my in-laws, I eventually taught my mother-in-law how to make it. She stills comments and we laugh even yet about how she learned the secrets of gravy making from me - after being married about 35 years. She was one hard working woman and had too much going on in other areas of her life to learn things like that about cooking. She is now 97 and BUSY with Bingo every day! lol. Bless her heart. Sorry for the long story but this really got me to remembering... Thanks! Dear Lily, never apologize for a long story with me! I love your story! And it makes me very happy to picture your MIL enjoying her leisure at the age of 97. So many of my very best memories are food memories, it seems. Jean there is no such thing as a good poultry dish without the traditional gravy. Thank you for providing us with a recipe we can sink our teeth into. Pinning for future use. Thanks, Mary! I hope you'll like it as much as we do. In my family, gravy was practically a beverage! What a great idea! Thank you for sharing this at Monday Social. Thanks, Eilis! I like to streamline meal prep wherever I can! Thanks, Annette. When you're feeling brave :D I think you'll find it's easier than you ever thought!